My food journey went kind of fast last year and whilst for Christmas I was requesting veggie cookbooks, I'd already turned my back on milk, eggs and cheese, and then come February went fully raw for the following 6 months. So my gorgeous new cookbooks went unopened for a while. Hugh got sent out on loan to a good friend but I couldn't bring myself to part with Ottolenghi's Plenty. So it sat on the shelf for a while. But as I've got more confident with my raw prep, I've looked outside of the raw texts (although still would love more of these if any present fairies are listening...) and love seeking inspiration then seeing how I can create a dish that fits into the low fat, high carb lifestyle I'm embracing for myself. And I kept going back and back to this one, convinced I could cut out some of the oil, adapt this and that, remove the goats cheese, but never really got all that far. Until last night. Having bought figs off the market and forgotten to take them out with me to a ceilidh (I drank homemade dandelion wine instead - whoops! (delicious though!)) I was looking at them and the apricots sure that I could do something good - and that perhaps this time Yotam could be the man to help. It was mainly for the sauce that he 'stepped in' and I have to say his Mango and coconut rice salad (although absolutely nothing like what I created) did get the cogs turning and assisted in the creative process. I like to allow for individual variation (I'm shocking at being told what to do) so feel free to adapt. I used 10 cherry tomatoes, 3 spring onions, 1/2 red pepper, 5 figs (keeping aside 1 for decoration) 5 apricots (same - keep one aside for decoration) and 2 stalks of celery. Chop and place on top of the rice. I also added a handful of sultanas which I'm loving on my salads and dinner recipes at the moment. 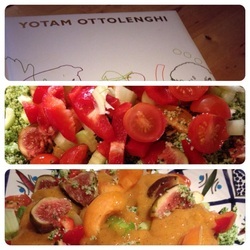 Yotam had peanuts in his recipe which I was tempted by and they did add a lovely bit of texture. If you're staying away from nuts then just avoid this bit. Blend until smooth. Pour over the veggies and 'rice' then decorate with the figs and apricots.